The Maldives is heading towards peace, stability and consolidation of democracy after ten tumultuous years, former President Mohamed Nasheed said at a youth forum organised by the Junior Chambers International (JSI) chapter of Maldives and Dhiyouth at City Hall on Monday night (September 16). “I don’t really see much room for going wayward now. People might try to rig two or three elections. [They] might try to arrest some people. And there might even be three or four coup d’etats. But, overall, I don’t see this curve slumping too much,” the Maldivian Democratic Party (MDP) presidential candidate said in his keynote speech at the event, which was held to mark the International Day of Democracy. Nasheed was elected president in the Maldives’ first multi-party democratic election in 2008 following the adoption of a democratic constitution. The 2008 election and liberal constitution was preceded by a pro-democracy movement led by the MDP in the wake of unprecedented civil unrest in September 2003, which was precipitated by a brutal custodial death exposed to the public and subsequent fatal shootings in prison. In his speech, Nasheed argued that the most important prerequisite for youth development was an atmosphere conducive to exercising the rights of free expression, assembly and participation in peaceful political activities. As 60 percent of the Maldives’ population is youth, Nasheed said political parties have to explain their policies to the youth demographic. It is also the duty or responsibility of youth to have their say in the formation of a government that would pursue the best policies for young people, their families, and their communities, he said. Freedom of speech and expression of dissent are “essential bases for nation-building,” he added. 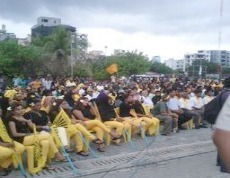 Democratic practices were introduced in the Maldives between 2005 to 2008, Nasheed continued, noting the role and “sacrifices” of youth in pro-democracy activism. 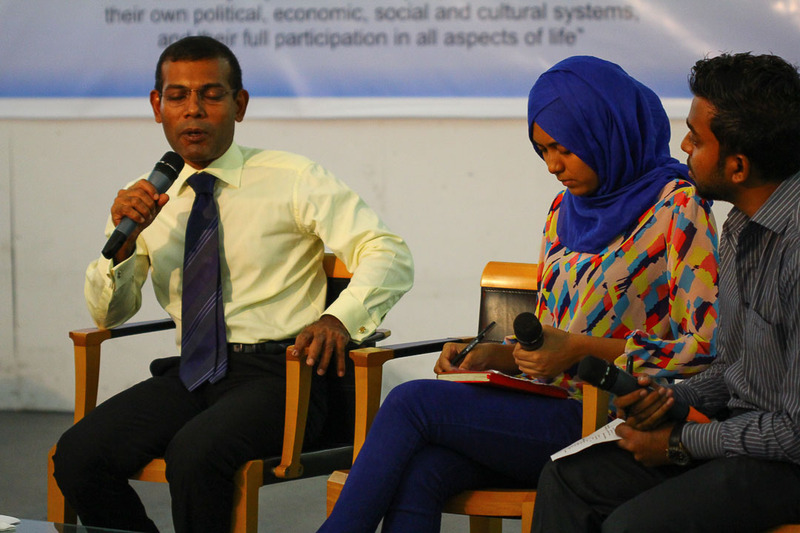 In formulating the MDP’s manifesto for the 2013 presidential election, Nasheed said the party believed that the bulk of the policies should target youth. In contrast, he said, the 2008 manifesto was focused on establishing a social security system. The 2013 manifesto reflects “the extent to which youth have raised their voices concerning their needs during the past five years,” Nasheed said. 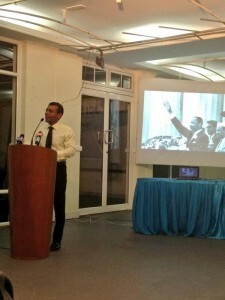 The MDP manifesto – the “result of conducting a democratic exercise of consultation” – includes creating 51,000 job opportunities, conducting a skills training programme, setting a minimum wage, providing higher education opportunities, offering grants and scholarships, growing the entertainment sector, and establishing sports facilities, Nasheed noted. Nasheed also stressed the importance of rehabilitating youth incarcerated for drug abuse through a “Second Chance” programme and implementing policies for reintegrating drug addicts into society as gainfully employed youth. Following his remarks, Nasheed participated in an hour-long question and answer session on topics ranging from civic education, family planning, minimum wage, job creation, policies for persons with special needs and feasibility of infrastructure projects. On the issue of negative campaigning, Nasheed predicted that political parties would learn ahead of future elections that defaming rivals was ineffective and focus instead of presenting comprehensive policies. “I predict that political parties will present policies much more in the next election rather than do what they’re doing now, which includes attempting to buy votes – people are learning each election that [vote buying] is unsuccessful,” he said. As a “crude survey” has estimated that seven percent of the Maldivian population are persons with special needs, Nasheed said the MDP will pursue policies to amend building codes to ease access and establish at least one school in each atoll to provide specialised education for students with special needs. A minimum wage of MVR4,500 (US$292) a month would meanwhile incentivise local businesses to hire Maldivians in lieu of foreign workers who were often paid only US$150 a month, Nasheed explained, adding that small businesses would be exempt from the legally mandated wage. 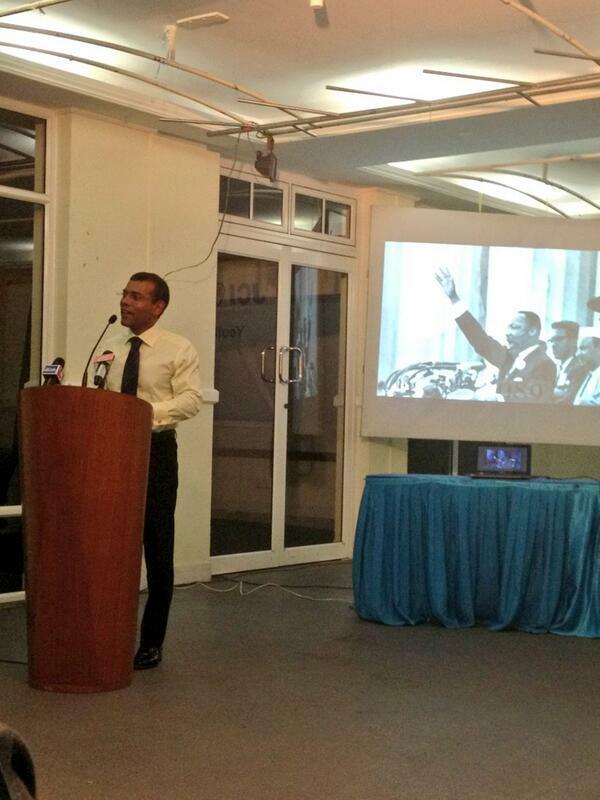 Asked by “a youth leader currently representing the Maldivian youth to the Commonwealth” whether an MDP government would consider “a democratically-elected youth council and youth parliament” as a forum for youth leaders, Nasheed invited youth interested in politics to forgo “ceremonial” and “superficial” activities in favour of direct participation. “The real thing is better than superficial activities. Step up to a podium no matter how young you are and participate in real activities – 17, 18 or 19 years is not really that young. At the time I turned 20, I had been in the pillory for 30 days,” he said. The Progressive Party of Maldives (PPM) has said it expects to release its full manifesto both in print and online in the next 48 hours. After the party yesterday (August 30) unveiled its economic policy, PPM Youth Wing President Dhunya Maumoon was quoted as saying that a full manifesto document would be available to the public in the next “couple of days”, according to local newspaper Haveeru. PPM Presidential Candidate Abdulla Yameen is the last individual contesting the election on September 7 not to have launched his full manifesto. His rivals; MP Gasim Ibrahim of the Jumhoree Party (JP); President Dr Waheed – standing as an independent – and former President Mohamed Nasheed of the Maldivian Democratic Party (MDP) have all released blueprints for their respective plans if elected to office. Yameen – half brother of former autocratic President Maumoon Abdul Gayoom – has this week nonetheless detailed key factors of the PPM’s economic policy should he become head of state. According to Sun Online, the policy will include attempts to lower current interest rates on loans for develop tourism or fisheries businesses. He expressed concern that while interest on loans was offered by the country’s banks at a rate between 10 to 12 percent, members of public with savings in these same banks were receiving between three to four percent of their deposited funds. Yameen was quoted pledging to try and curb the difference between the costs associated with borrowing and saving in the Maldives in line with other countries. Current tourism Minister and PPM Deputy Leader Ahmed Adheeb also helped unveil the party’s economic policy, pledging to oversee “serious changes” to the country’s economy at macro-level. According to Sun Online, Adheeb unveiled the party’s plan to launch ‘economic regions’, while also showing videos detailing several harbour constructions and a proposal for an airport in Kulhudhuffushi. Minister Adheeb was not responding to calls at time of press, while Minivan News was awaiting a response from PPM MP Ahmed Nihan concerning the party’s manifesto launch. Despite holding the largest number of MPs of any party serving in President Waheed’s coalition government, PPM Leader former President Gayoom earlier this week expressed concern that the Maldivian economy had been “seriously damaged and destroyed”. He argued that Yameen was the only presidential candidate with the required experience to bring economic stability to the country. Speaking during the launch of its own manifesto earlier this month, the JP, led by business tycoon and MP Gasim Ibrahim, claimed it expected to finish above the Progressive Party of Maldives (PPM) in the first round of the upcoming presidential election, before securing a second round victory. JP Policy Secretary Mohamed Ajmal has said the party’s manifesto included a pledge for a ‘holistic’ approach to taxation, promising to introduce income and capital gains tax, and increase taxation of the wealthy. This would include reducing the 60-70 percent of national income devoted to recurrent expenditure to 40 percent, by investing in local infrastructure and raising revenue through the private sector. The JP has also launched a ‘Religion and Nationalism’ policy, pledging to strengthen Islam in the Maldives, including the establishment of an Islamic University, introducing Arabic as a teaching medium, strengthening relations and donor ties with other Islamic nations, and making the Quran a mandatory school subject. Meanwhile, President Mohamed Waheed’s ‘forward with the nation’ coalition, which claims to have been the first party to fully outline its election plan after rolling out its policies in July and early August – has outlined four key campaign focuses based around Islam, social protection, education and environment. Among the incumbent’s pledges are plans to establish “floating hospitals” in the north and south of the country, a 50 percent reduction in household energy bills, opportunities for empowering women along with the provision of social protection and education and vocational training for Maldivians up to 18 years of age. The opposition MDP has published what it calls a ‘Costed and Budgeted’ manifesto, including plans to establish 51,000 job opportunities, a savings scheme for higher education, a student loan scheme, a MVR2000 (US$129) allowance for every single parent and person with special needs, and an allowance of MVR2300 (US$149) for the elderly. Former President Nasheed also pointed out the importance of introducing a development bank in the Maldives during a rally to launch the full document on August 24. “Take a look, this manifesto will not contain even a single policy which has not been accounted for. Even if we are asked to submit a budget to the parliament by tomorrow, we are ready to do so,” he said during the launch. The party has separately unveiled policies based around expanding mid-market tourism through focusing on supporting guesthouses on inhabited islands, and a specific youth development plan focused on sports and entertainment. The Maldivian Democratic Party (MDP) held a parade and rally on Saturday (August 24) that it claims was attended by over 8,000 supporters in order to launch their complete manifesto, titled “Costed and Budgeted 2013 – 2018”. After a parade down Majeedhee Magu – the main street through Male’ – MDP presidential candidate and former President Mohamed Nasheed addressed his supporters and explained the contents of the party’s manifesto. “These policies in our manifesto are based on what we learned when we walked door to door, conversing with citizens, enquiring what your thoughts and needs are,” Nasheed said at the rally held in the ‘Raalhugandu’ area. “I am not contesting in the upcoming elections with a handful of empty vows. Our competitors’ pledges are made in a manner where, if coming on to an island the first person they meet asks for a fishing vessel, they promise to deliver fishing vessels for them all. And then say they meet a teacher who asks for an iPad, whereupon they’ll pledge to give iPads to all teachers. The next person in line might say he is not feeling well, whereupon the candidate may vow to deliver a nurse and doctor to each house. This is not how a political party should form its pledges,” said Nasheed, criticising the competing candidates for the upcoming September 7 election. Highlighting the contents of the manifesto, Nasheed stated that it included plans for introducing 51,000 job opportunities, a MVR120 million (US$7.7 billion) savings scheme for higher education, MVR118 million (US$7.6 billion) student loan scheme, 20,000 accomodation flats, a MVR2000 (US$129) allowance for every single parent and person with special needs, and an allowance of MVR2300 (US$149) for the elderly. Nasheed further stated that the party found it highly concerning that “the national debt is 82% of national production”, saying that the manifesto has been designed keeping the factor in mind. “We will continue to implement the tax system we established in our first term. We will carry out development work without increasing GST and taxes from business profits. We will also introduce income tax, as we previously proposed in 2010,” he continued. The presidential candidate also stated that it was “of utmost importance” to establish a development bank in the country. “We especially discussed this with the Asian Development Bank and the World Bank, and based on existing studies made with the assistance of the UNDP, our aim is to establish a development bank within the first year of our term,” he stated. “With 600 million rufiya from our state budget, and 400 million rufiya from international financial bodies, the development bank will be able to release funding for the generation of 1 billion rufiya capital,” he continued. According to Nasheed, the manifesto includes plans to spend MVR16 billion (US$1 billion) on social protection. Concluding his speech, Nasheed stated that the MDP Manifesto included plans to assure that life becomes better in many aspects for the public. The former president finished by stating that all that was now left for the public was to go vote. 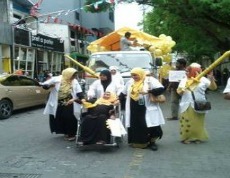 Prior to the rally, MDP held a parade down Majeedhee Magu with over 8,000 supporters. In addition to Nasheed, Speaker of Parliament Abdulla Shahid, Male’ City Mayor Ali Manik, and several MDP MPs were seen in the frontlines of the parade. The atmosphere appeared festive, with different groups performing different acts throughout the parade. Besides pompoms, streamers, and balloons, each ward of Male’ had prepared a small truck to represent one of the pledges included in the party’s manifesto. While one truck represented the health insurance policy – with actors depicting a scene in a hospital’s maternity ward – another represented the guest house policy – with an actor lounging on a truck designed to look like a beach. Traffic police officers provided security throughout the parade. Contrary to some previous demonstrations and rallies, no hostility was observed between police and participants of MDP’s rally. Minivan News observed one policeman being asked by rally participants if he had received a letter from Nasheed, adding that if he had not then he must be ‘baaghee’. The young participants were referring to a speech delivered by Nasheed last week, in which he stated he had sent letters to all police officers, except those who had directly partaken in what the MDP alleges to be the February 7 coup d’etat. The policeman responded by taking a folded up piece of paper out of his pocket and showing Nasheed’s signature on it to the supporters who had questioned him. Progressive Party of Maldives (PPM), headed by former President Maumoon Abdul Gayoom, submitted registration forms to the Elections Commission today. PPM interim council member Aishath Azima Shakoor told Haveeru that the commission would register the party within a week’s time. The commission has a one-month period to formally register the party. PPM held its registration meeting on Saturday at which it elected former President Gayoom as its interim President, rejecting no other applicants for the position. The party also approved its constitution, manifesto, and palm-crescent logo with the official party color, magenta. The passing of the 2011 state budget will allow for much faster development of infrastructure projects across the Maldives, President Mohamed Nasheed has said, as street protests by NGOs, civil servants and private citizens took place last week over concerns about the finance plan. Miadhu reported that the president used his radio address on Friday to claim that the country’s finances for 2011 represented “a different type of budget” following multi-party consultation. Nasheed also said that he was hopeful the “objectives” of this year’s budget could all be achieved by 2012. Miadhu reported that the budget has been said to be designed for the first time around various government programmes mandated by the Maldivian Democratic Party’s (MDP) own manifesto. On Thursday, hundreds of protestors took to the streets around the Majlis to show their frustration at amendments included within the budget that could lead to increased salaries and other privileges for MPs. According to the new bill, parliamentarians could receive up to an additional Rf20,000 in their salaries for attending committees, while also being allowed to import vehicles without paying any duty on them. Parliament also approved measures to reinstate the salaries of independent commissions, while failing to address the reduced salaries of civil servants.